It’s all around us. It makes up 70% of our bodies, flows through our homes and businesses every day, and sustains us. But for me, my local river is much more than a drinking water source, it’s my life. Over the past nine years, the Chattahoochee River has provided me a reprieve from the hustle and bustle of a hectic city life and the strength to get through two cancer diagnoses. It is also why I get up and go to work every day as a senior staff member of the nonprofit Chattahoochee Riverkeeper. You know how they say #WaterIsLife? Well for me, it couldn’t be more true. I was connected to the water long before my work within the environmental movement began more than a decade ago. My father has a passion for saltwater fishing. He always wanted me to join him on his expeditions, but in my youth I never found much interest in fishing. Instead, I spent hot summer days on the lake and relaxing vacations playing in the surf on the beaches of south Florida. I was drawn to the outdoors – a ‘spiritual connection’ I found in my childhood. But it wasn’t until the summer of 2007, when a position opened with the Catawba Riverkeeper in Charlotte, NC, that our rivers gave me my calling. I had been working in the nonprofit world for a number of years when the Development Director position at Catawba Riverkeeper opened up. I didn’t know much about the environmental movement, but it was a step up in title and I was eager for a new adventure. So I jumped in with both feet. 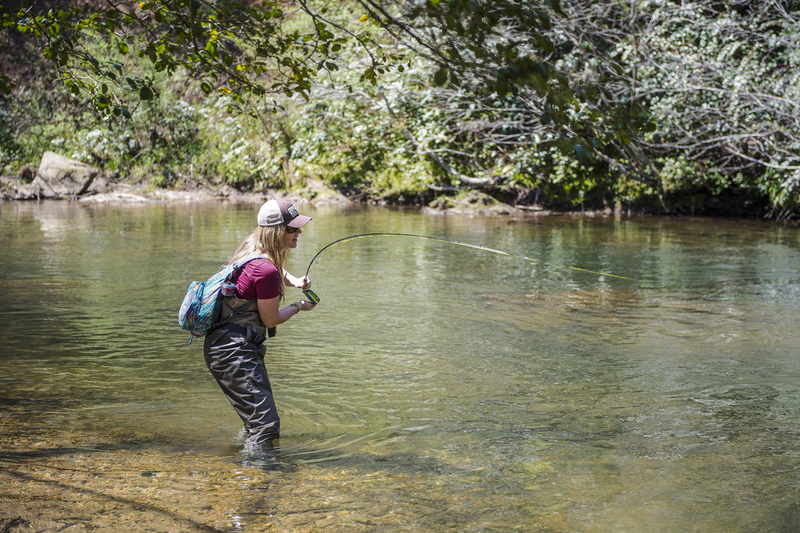 The Chattahoochee River is the second southern-most trout stream in the United States. For those who aren’t familiar with Waterkeeper Alliance (WKA), it is the largest and fastest-growing movement solely focused on clean water. WKA unites more than 300 Waterkeeper Organizations around the world, focusing citizen action on issues that affect our waterways, from pollution to climate change. The Waterkeeper movement patrols and protects more than 2.5 million square miles of rivers, lakes, and coastlines in the Americas, Europe, Australia, Asia, and Africa. The movement defends the fundamental human right to drinkable, fishable and swimmable waters from the Chattahoochee River to the Himalayas. My boss at Catawba Riverkeeper was a woman named Donna Lisenby. She was a firecracker, one of the strongest female advocates I had ever met—and I had worked with the women of N.O.W. (National Organization for Women) throughout college. I give her credit for showing me the ropes and illustrating why protecting our waterways is such an important mission. During my time at Catawba Riverkeeper, I watched as she played a key role in changing the Carolinas’ inter-basin transfer laws and was the first environmental advocate to blow the whistle on leaking coal ash ponds across the state. She commanded her audience—people really respected her. While Donna may have given me my start, after two years working on the Catawba my world changed when I crossed paths with the seminal figure in the water movement in the southeast—Sally Bethea. In 2009, I headed back to my hometown of Atlanta, GA, to take a position as the Development Director for Chattahoochee Riverkeeper (CRK). I would be working under the leadership of Sally, CRK Co-Founder, who had also been a founding member of The Waterkeeper Alliance. Many have called Sally a pioneer. Her successful brand of place-based advocacy paved the way for women around the world to become leaders in the protection of our waterways. In the early 1990s, she stood her ground against the City of Atlanta when millions of gallons of raw sewage were being dumped into the Chattahoochee River daily. When others said she couldn’t, she proved them wrong. Sally passed the reigns on to my current boss, Juliet Cohen, who has brought CRK into this new technological age. I have been so grateful for the opportunity to work alongside many strong women in my lifetime. It is because of these women, that I am excited to get up and go to work every day. Negative ions released from moving water are believed to increase levels of serotonin, helping alleviate depression, reduce stress, and boost energy levels. In my position at CRK I oversee all fundraising, events, and corporate relationships for the organization. Along with my team, we are responsible for raising the $1.8 million budget that keeps boots-on-the ground and a group of committed individuals out on the river taking water samples, investigating sewer spills, collecting trash, distributing rain barrels, educating youth, and making sure that the community’s right to enough clean water is always protected. This job has changed my life. I am part of a team making real, impactful differences in the world. Beyond that, my position has allowed me to build relationships with people who believe so much in the work that we are doing that they have become like family to me. This is especially true with our cause-marketing partnerships. Through these relationships, my connection to our river has only grown deeper and more personal. In 2015, CRK was approached by The Orvis Company and SweetWater Brewing Company. They wanted to start a cause marketing campaign to raise more awareness around the work our organization was doing to protect the local waterways. After all, the fly anglers who spend their days on the river should have a vested interest in its protection. The Quality Hooch Campaign was born. 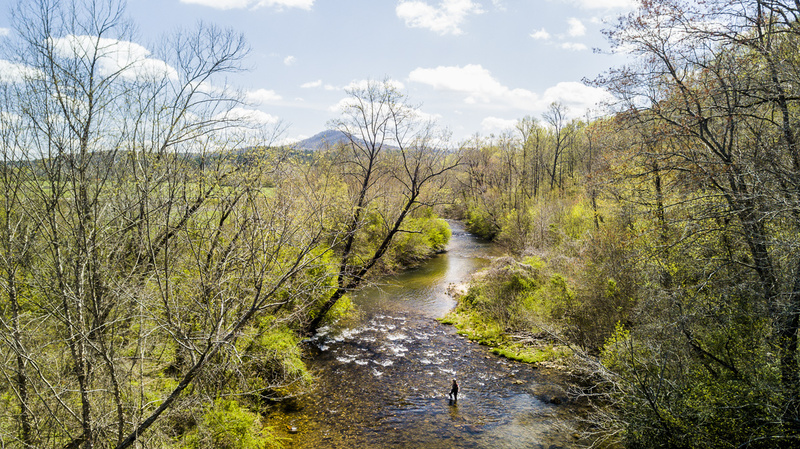 Not only is the Chattahoochee River the drinking water source for nearly four million people – it is one of only three rivers in the world that runs through a population of one million or more and supports a thriving trout fishing habitat. Now in its third year, the partnership so far has raised $30,000 for CRK’s water monitoring efforts. 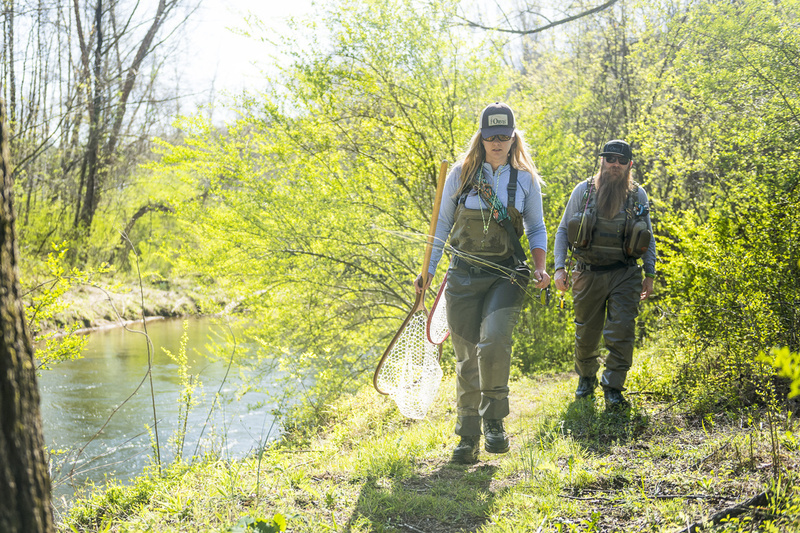 Most recently, the campaign has supported CRK’s BacteriALERT project, a water monitoring initiative that is especially important to the region’s anglers. BacteriALERT takes place within the National Park Services’ Chattahoochee River National Recreation Area (CRNRA), which receives approximately three million visitors annually (including anglers and kayakers). The CRNRA encompasses 48 miles of the Chattahoochee River from Lake Sidney Lanier’s Buford Dam to Atlanta; this section runs through the highly urbanized greater metro Atlanta region. The program is very popular with Atlanta’s fishing community because it is the only system that provides real-time information about health risks from contact with the water in the park. Through a system of remote water quality sensors and laboratory analyzed samples, the BacteriALERT program issues public advisories to river users during times when E. coli levels exceed the U.S. Environmental Protection Agency recommended values. The continuation of this important program is vital to protecting the public health and safety. Not only has this partnership opened doors for CRK to the local fishing community to share our mission of water protection and conservation, but it put a fly rod in my hand. Something that has made a profound impact on my life. 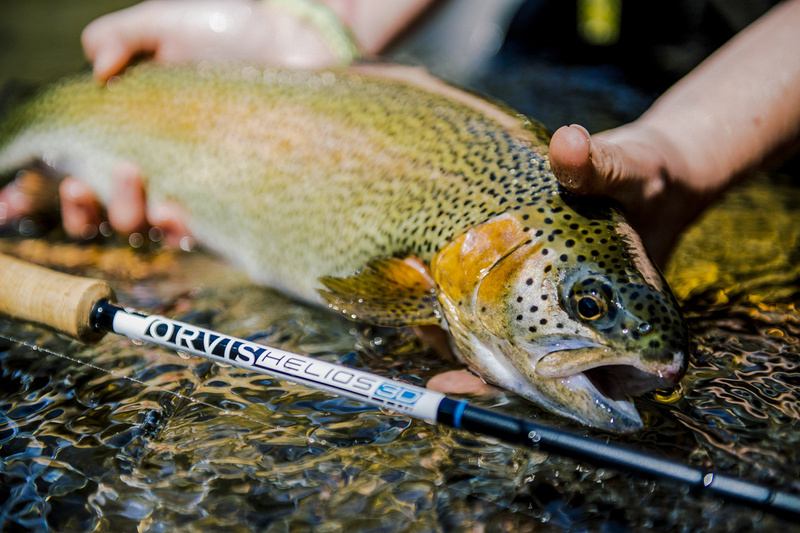 In 2016, Orvis and SweetWater hired a production company to do a feature on the Chattahoochee River’s unique trout fishery and CRK’s efforts to protect it. They sent me a first cut of the film to get my comments. I immediately pointed out that there were only a bunch of ‘old white dudes’ in the film, and with a growing female market in the industry, they were definitely missing the mark. Well you can imagine what happened next. 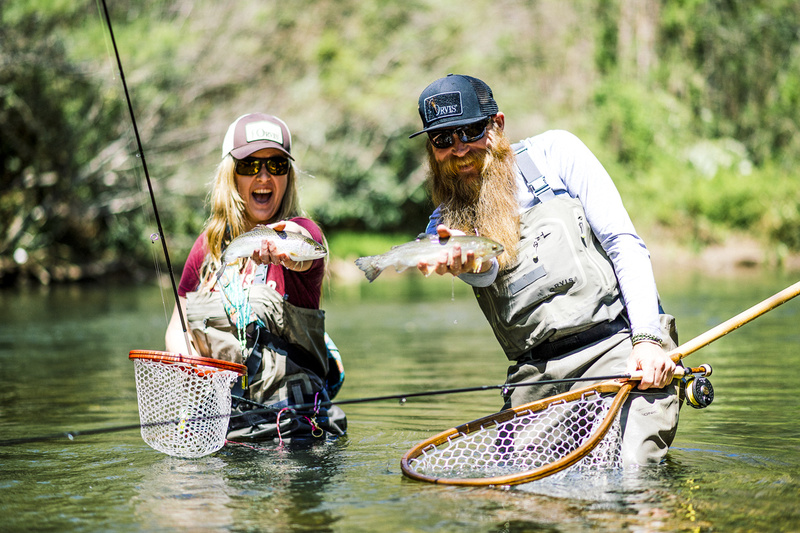 “Well OK, Becca, meet us on the river bright and early next Tuesday.” I had, without realizing it, signed myself up to be the female face of angling on the Chattahoochee. I showed up at the river that day, bless my heart, with an old pair of Cabela’s waders and boots that I had borrowed from one of the guys at work, not knowing WHAT I had gotten myself into. This was an Orvis-led shoot full of experienced anglers so the production company looked at me like I was an idiot. As soon as I stripped down to my river shorts and Chacos, I met the guys who would be taking me out on the boat to film. How could I have known that the charming fly fisherman from Destin, FL, would end up asking me to marry him a year and a half later? That day, on a River Through Atlanta drift boat in the middle of the Chattahoochee River, I fell in Justin’s lap—literally. Whether I was clumsy or it was fate, I knew from that moment that this river rat and I were meant to be in each others’ lives in some capacity. What started off as a friendship quickly turned into a love of a lifetime. And before I knew it, Justin was signing on with Orvis Atlanta and moving up to Atlanta from his home in Destin. Last December, fly rods in tow and on a snowy bridge at Dukes Creek, Justin asked me to spend the rest of our lives together. In October we get to join our family and friends at the river we met on to say our vows and begin our life as husband and wife. Water really is life. It connects us all. My life as a fly angler began that August morning in 2016. I immediately felt at home on the river. City life had started to wear on me, and there was something peaceful about standing in a stream in the mountains with nothing but the sounds of birds and the occasional splash of a wild trout coming up to say hello. I realized that this sport made my busy life slow down, even if just for a moment. It was a feeling I had been yearning for. Although the free “therapy” I got from being out on the river was nice, fly fishing really found a special place in my heart when I was introduced to Casting for Recovery. Early in 2016, I had undergone a double mastectomy after an invasive breast cancer diagnosis. I met Justin in the midst of my reconstruction surgeries when I was feeling bruised and broken. 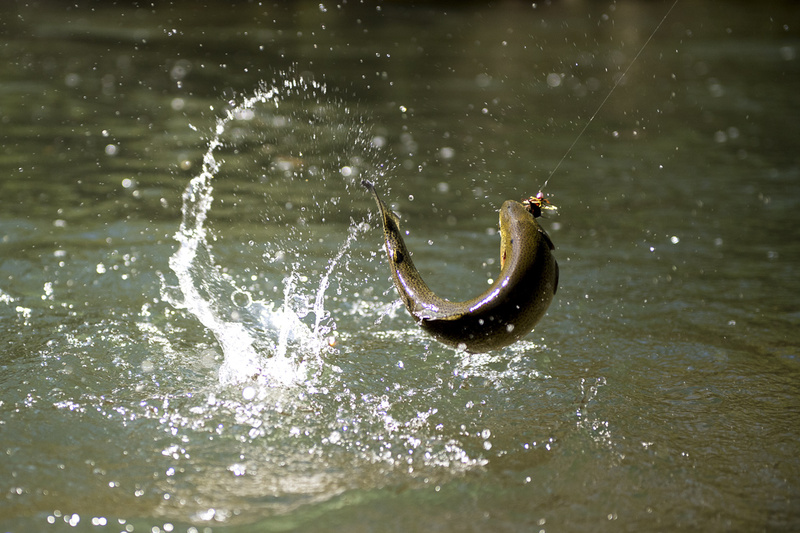 My introduction to fly fishing helped bring back some of the confidence that I had lost. I guess you could say that the new skill I was learning empowered me, and the relationship that it brought helped build me back up. Fast forward to March of 2017—Justin and I scheduled a fishing trip to Helen, GA to shoot a short film about trash in our waterways and the importance of doing your part to keep the river clean. 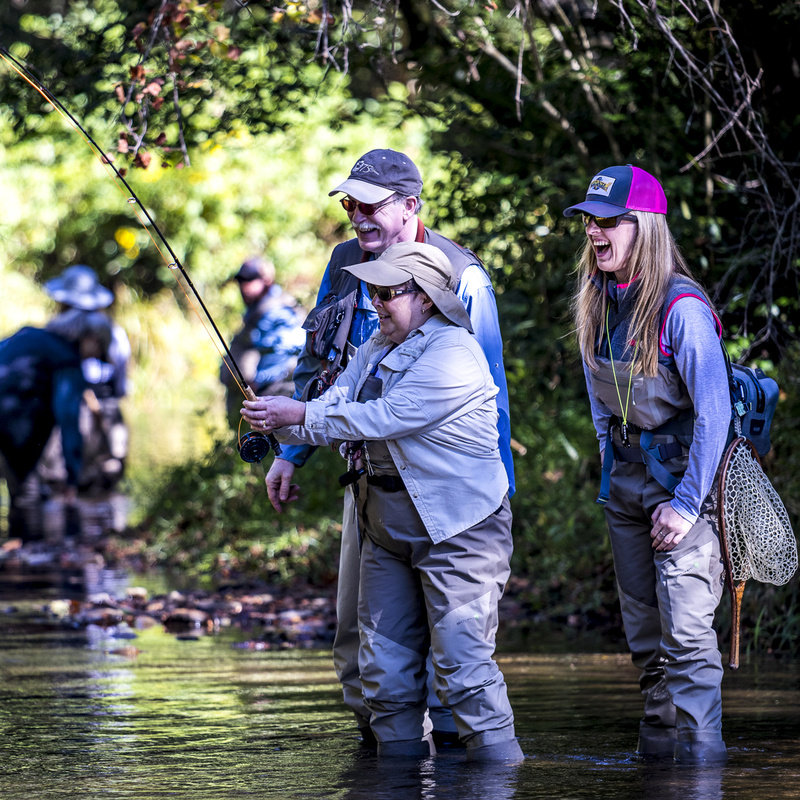 During the trip a friend told me about an organization he was involved with that brought women managing a breast cancer diagnosis out for fly fishing retreats. I immediately connected to the mission of this organization, as I knew first-hand the benefits this lifestyle offered women on the mend from such serious diagnoses. A few months later I was introduced to Casting for Recovery Georgia (CfR GA). With CfR GA I started to feel like a real part of the fishing community. I was given the opportunity to interact with guides and fly shops, and to help make connections with outdoor companies looking to support breast cancer initiatives. I was able to lend my skills to a cause near and dear to my heart. It was the perfect match. Soon after I started volunteering with the organization, I received my second cancer diagnosis. This time the cancer cells were in my thyroid and I would have to undergo a thyroidectomy in December. I was heartbroken. I wasn’t ready for another surgery. Lucky for me, this time I had fly fishing to help bring me clarity. After my diagnosis I dove into my volunteer work with CfR GA and found every opportunity to get out on the river. My first volunteer experience with CfR was during Georgia’s first Stage IV breast cancer retreat. 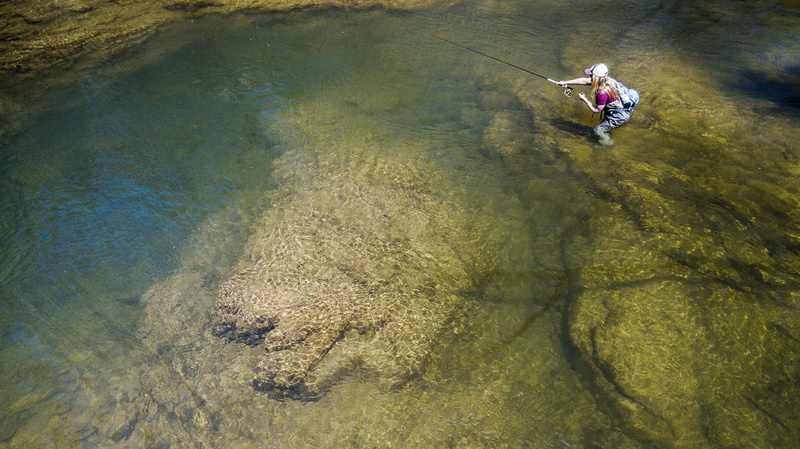 I was paired with “Amazing Anne.” She had never been fly fishing before, but nonetheless was casting with the confidence of a seasoned angler after only minutes in the water. Anne only caught one fish that day—a baby rainbow trout about two inches long. But the smile that radiated across her face was one that I will remember for the rest of my life. She had a moment on that river where she didn’t have to think about treatment, or surgeries, or hospital bills. She had a moment where life slowed down. I knew that feeling all too well. To fish really IS to HOPE. 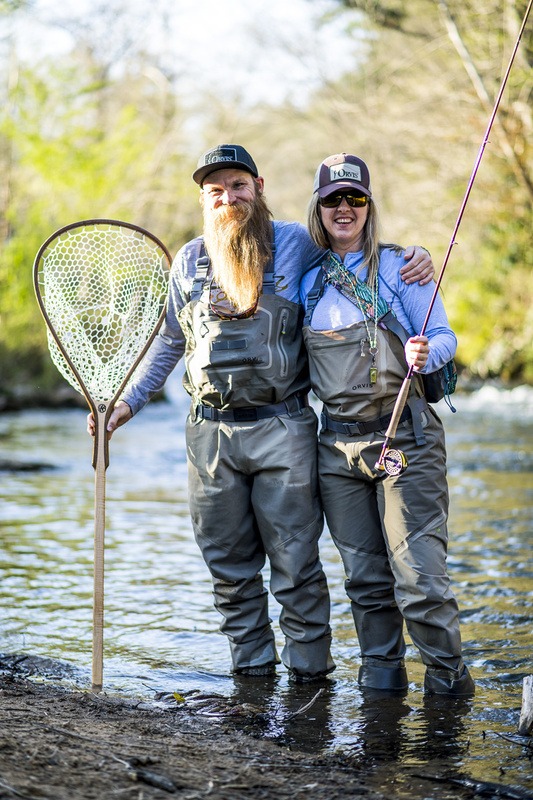 Fly fishing has introduced me to some incredible people in my community. From my work with Orvis, CfR GA, Georgia Women Fly Fishers, Trout Unlimited, and the many folks who find themselves at CRK events supporting the river, I have shared waters with people I know will be lifelong friends. I think Justin pulled me out to fish with him those first few times with a casual thought that I would join him on excursions every now and then. Now, I am ready to embrace fishing with my whole heart. Now I go without him. And he supports it, even if he is not too keen to receive photos of my big trout while he’s hard at work and stuck indoors. 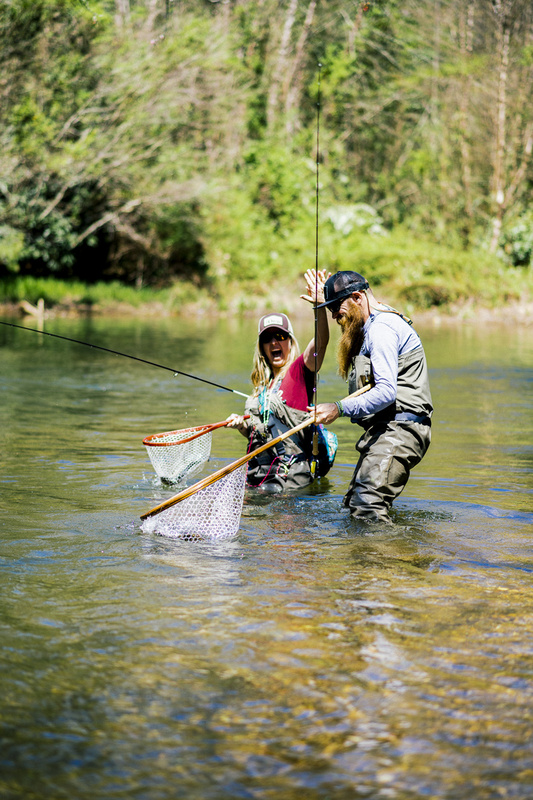 For me, fly fishing is much more than just the hope that comes with throwing my line and the thrill that comes with the “big catch.” Wading out into the water with my fly rod in hand has shown me strength, peace, freedom, a way to give back, and a beautiful new family.